An unaltered photocopy of your DD-214, WD AGO, NAVPERS, NG clearly displaying your award of the Army Commendation Medal. If your ARCOM is not listed on your DD-214 you must provide a copy of your DD-214 -AND- a copy(s) of other military-issued documentation authorizing your award. a. 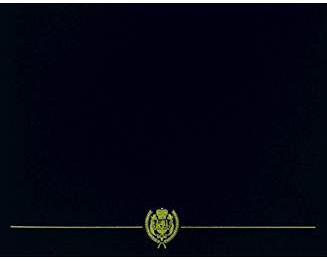 The Army Commendation Medal (ARCOM) was established by War Department Circular 377, 18 December 1945 (amended in DA General Orders 10, 31 March 1960). b. The ARCOM is awarded to any member of the Armed Forces of the United States who, while serving in any capacity with the Army after 6 December 1941, distinguishes himself or herself by heroism, meritorious achievement or meritorious service. Award may be made to a member of the Armed Forces of a friendly foreign nation who, after 1 June 1962, distinguishes himself or herself by an act of heroism, extraordinary achievement, or meritorious service which has been of mutual benefit to a friendly nation and the United States. 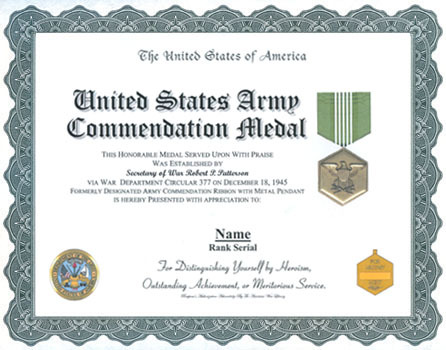 c. Awards of the ARCOM may be made for acts of valor performed under circumstances described above which are of lesser degree than required for award of the Bronze Star Medal. These acts may involve aerial flight. d. An award of the ARCOM may be made for acts of noncombatant- related heroism which do not meet the requirements for an award of the Soldier's Medal. e. The ARCOM will not be awarded to general officers. f. Awards of the ARCOM may be made on letter application to Commander, ARPERCEN, ATTN: DARP-VSE-A, 9700 Page Boulevard, St. Louis, MO 63132-5200, to any individual commended after 6 December 1941 and before to 1 January 1946 in a letter, recognition, or order of commendation, as distinguished from letter of appreciation, signed by an officer in the grade or position of a major general or higher. Awards of the Army Commendation Ribbon and of the Commendation Ribbon with Metal Pendant were redesignated by DA General Orders 10, 31 March 1960, as awards of the Army Commendation Medal, without amendment of orders previously issued.